I never thought I’d see the day I would give a Bolliger & Mabillard designed coaster such a low rating. I like, if not love, all of their installations. Their coasters offer the smoothest rides while still delivering thrilling and innovative manuevers. Well, now I have to say that I love “almost all” of their coasters. The Mantis opens with a straight 130 foot drop. Next you enter a massive vertical loop that offers some g-forces, but nothing too intense. The dive loop is pretty smooth then you rise up and swoop back down for the inclined loop. That’s where things go wrong. The rest of the ride there was this pressure in my legs and feet that was pretty painful. Add to that some pretty substantial headbang on turns and in the last inversion (corkscrew). For the last two-thirds of the ride I was just waiting for it to end. A feeling I’ve never had on a B&M coaster. Note – This is an official video that was filmed by professionals with permission from the park. For safety reasons, please DO NOT take a camera on a roller coaster. Did you have a similar experience on Mantis? Leave a comment below. sry, but this is probably one of the rates that makes no sense to me. I am 6'2", and i LOVED Mantis. there was some pressure on my calf muscles, i admit, but despite that, this ride was AWESOME. i don't see whats so bad about this ride atall. I have to disagree with your 4 rating here. I've probably ridden Mantis 10 times and I have never felt excessive pressure in my legs. There a chance that your seat wasn't quite adjusted right and you didn't have enough of your weight supported by the small seat. I'll agree that it does bang your head around at times, but I think the huge first loop along with a few of the twists at the end make this coaster a good time. Sure its not great, but I have to argue that a high average score like a 6 would be more appropriate. i always wanted to go on this coaster. my uncle came back from cedar point. he told me in these exact words. NEVER RIDE MANTIS. that explains it all. My dad and best friend agree…This ride JERKS and HURTS. The park employee says this has the most g-forces IN THE PARK 2nd only to Max-Air…! My dad hurt his back on this ride. My friend passed out. I probably would have died. NEVER RIDE THIS. Yep. It was probably one of the most uncomfortable rides I've ever experienced on a steel coaster. Shorter lines for me. Yippee! speaking of rough steel coasters, could you make a top 3 thursady on the most rough steelies. Speaking of standups, I saw in your chang review that It was your favorite standup. Was Riddlers Revenge any good or was it kind of painful like mantis? Oh and mantis was kinda rough but I like it better than the vortex because vortex is too short. Riddler's Revenge was very close to Chang. They have a similar, but not identical layout or at least share a number of elements. Chang was also such a surprise because the surrounding park was so sub par. CC, you mentioned Vortex at Carowinds and Georgia Scorcher at SFOG. How do those compare with the average stand-up? Can you do a review on them soon, or maybe give a Top 3 stand-ups week? I've only been on Vortex (above) when it comes to stand-ups, and I want to know more. I'd say Vortex at Carowinds is an average stand-up coaster. Georgia Scorcher is short, but above average in part because it's newer and smoother. Then you've got Riddler's Revenge and Chang at the top and Mantis and Shockwave at the bottom. I can't believe I haven't done a Top 3 stand-ups, but then again I haven't ridden that many. I'll make it my next T3T CFC. Thanks for the suggestion. I'd say Vortex is a pretty good stand-up considering it's B&M's third coaster since striking out on their own. Maybe something has changed since you last rode Mantis but I have to agree with it's supporters. In fact I would go as far as to say this was one of the more enjoyable coasters I rode on my day at CP (that wasn't MF or TTD). Smooth as glass and lots of very cool g's. Didn't bang my head or hurt my legs at all. The only two bad things are looking at the gross toilet water below the ride and the typical manhood crushing bike seats for stand-ups. This definitely deserves at least a 6 maybe a 6.5, especially from the front row. 4.0?! Mantis is a great coaster! The best stand up I've ever been on . It has a great layout and an incredible dive loop. My only problem with it is the trim on the first drop. It's pretty smooth and makes my legs tingle every time, although the stand-up restraint systems are always somewhat awkward. Mantis IS a good coaster, but it's just bad in comparison with the others. I just returned from 2 days at Cedar Point, and Mantis was the last ride of day 1. That day we rode Blue Streak, Power Tower, Millenium Force, Mean Streak, That Swinging Thing in the Back of the Park, Gemini, Corkscrew, Iron Dragon, and then Mantis. We left the park at around 6 to get dinner, probably because of this and Iron Dragon just putting a 3 hour drag on the day. M.S.,Gem., and Corkscrew were all a bit of a head-rattle and then Mantis just really sealed the deal. We'd also been up since 4 A.M. travelling so I thought I hadn't really given it a fair shake, and it might not have been responsible for our headaches, until reading the review. I enjoyed the ferris wheel the next day more than Mantis and Iron Dragon combined. 5'7", by the way; girlfriend is ~5'4"
Ive always found the Mantis uncomfortable and a snooze of a ride, another one I don't ride next to the Mean Streak. The last and only time I rode the Mantis was during its first season. During the day there I watched the first-aid golf cart come and go several times to the mantis to ferry away riders who had passed out or had experienced ill effects from what I surmise was the g-forces/poor seat height positioning that seems common with the Mantis. I can't recall over half of my ride on the Mantis due to fear for my life and constant pain and near 'black-out' in the loops due to what seemed like an intense amount of g-force. 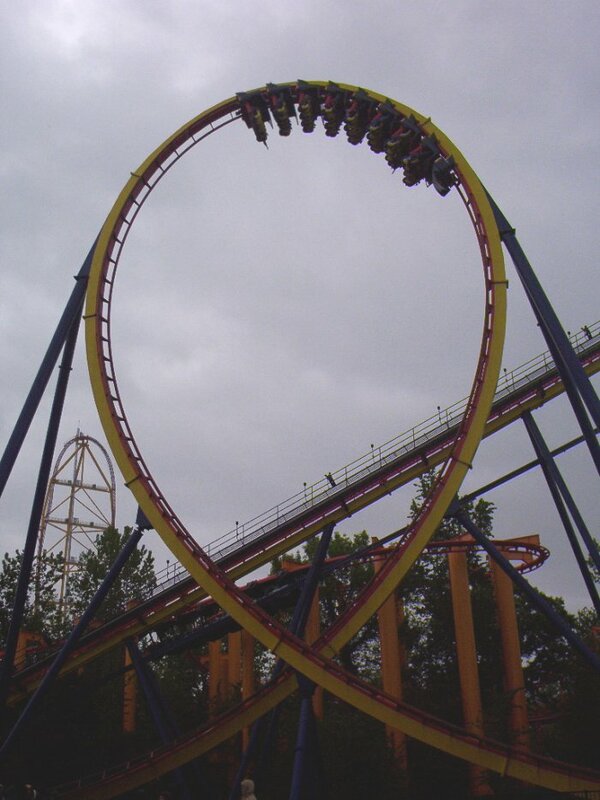 I've never had a problem with any other 'coaster at cedar point nor any other park I've visited. I wouldn't recommend this ride to anyone I know but take that with a grain of salt as it seems the ride is fine for some. Um……you seem to rate these coasters as if you can do a better job of creating them. I would like to see you make a 145ft stand up that doesnt put as much pressure on your legs as Mantis for Cedar Point, then maybe you could talk. I mean come on a 4, you could at least give it a 7! Mantis is an great ride! Nope. I'm not dumb enough to think I could do a better job making a roller coaster. Just like movie critics or food critics don't consider themselves skilled directors or chefs. I just report my experiences. There's no way a painful ride will ever get a 7 from me. Well Thats mean. But you do have a point. btw i'm ten, really want to go on the mantis, the only other roller coaster ive been on was gemini, is it scary? I've you've never ridden a looping coaster it might be a bit scary. You could warm up with Corkscrew just to get used to loops first then try Manta. People have had so many different experiences there's no way to know until you ride it. I agree with your review 100%, Mantis hurt my neck, legs, and head.